A walking holiday that explores two of the Veneto's most gorgeous locations - Lake Garda and the rolling Prosecco Hills. Enjoy a bird's-eye view of Garda's blue waters while hiking on the top of Monte Baldo, ramble through the vineyards and hamlets of Prosecco Country in the foothills of the Dolomites and reward yourself with a tasting of the famous bubbles. After joining the trip at Verona airport, we drive to the small resort of Torbole at the northern end of Lake Garda, our base for the first three nights of the holiday. The scenery at this, the lake's narrowest end, is some of its most dramatic, with high cliffs plunging almost vertically into the cool blue waters. This afternoon there is the option of a circular walk on some of the lower slopes above the lake on the Bussate to Tempesta trail. Blessed with a mild climate, they are cloaked in groves of olive trees as well as ilex and oak. Today's optional eight kilometre walk is expected to take approximately two-and-a-half hours with a total ascent and descent of 420 metres. Today we catch a local bus along the lake shore to Malcesine, an old town with picturesque cobbled lanes and a castle, which nestles between the lake and our walking destination today, the impressive Monte Baldo ridge which overlooks Lake Garda at an average altitude of around 1800m. Saving our legs, we take the superfast cable car from the town and enjoy a circular walk on the ridge with spectacular views down to the lake and across to the Alps in the distance beyond. We can have picnic lunch on the mountain before taking the cable car back down to Malcesine. There's time to explore Malcesine and people watch from one of its many charming cafes and bars before travelling back to Torbole. You can opt to take one of the ferries that ply the lake for a different vantage point. Today's 11 kilometre walk is expected to take approximately four-and-a-half hours with a total ascent and descent of around 500 metres. For our final walk at Lake Garda we depart from the hotel and take the lakeside trail to Riva del Garda from where we pick up the Old Ponale Road Path, the original road connecting Lake Garda and the Ledro Valley, that has been closed to traffic since the new highway opened in 1998. The path was partly carved out during the first world war and enjoys some fantastic views of the Lake Garda. Today it's very popular with hikers and bikers. We follow it all the way to Lake Ledro and along the lake shore to the small settlement of Pieve di Ledro. Lake Ledro is around 600 metres higher than Garda, hence the climate here is slightly cooler. From here a public bus takes us all the way back to Torbole. Today's 16 kilometre walk is expected to take approximately four-and-a-half hours with a total ascent of around 600 metres. Leaving Lake Garda behind us, we drive to the wonderful UNESCO-listed historic city of Verona for some free time to explore and have lunch. Verona reputedly has more Roman ruins than any Italian city other than Rome and also many medieval and renaissance buildings. Three of Shakespeare's plays are set in Verona: Romeo and Juliet, The Taming of the Shrew and The Two Gentlemen of Verona. We then continue to a nearby vineyard for the chance to enjoy a tasting of one of the Veneto's D.O.P. wines, the dry white Soave. Our destination for the next three nights is the attractive town of Bassano del Grappa. Situated on the Brenta River, at the point where the flat Veneto plains reach the foothills of the Alps, it takes its name from the nearby Monte Grappa. The town's architecture reflects Bassano's location: typical Veneto-style arcaded streets and piazzas are interspersed with alpine wooden balconies, and some of the hostelries have a decidedly Austrian flavour. Amongst the produce for which Bassano is known is one of the rarest delicacies in Italy, the white asparagus that appears between mid-March and mid-June and which we are sure to sample if our visit is in season. The other is of course the strong grappa liqueur produced in the area. Today's walk heads out directly from Bassano del Grappa along the Alta Via del Tabacco or Tobacco High Route in English, a path used by smugglers to transport the tobacco once cultivated in the area. The trail follows the Brenta River for some distance before climbing to a mid-level route with great views down to the river and back to Bassano. It passes through a number of hamlets before arriving in the town of Campolungo from where we can catch a local bus back to Bassano. 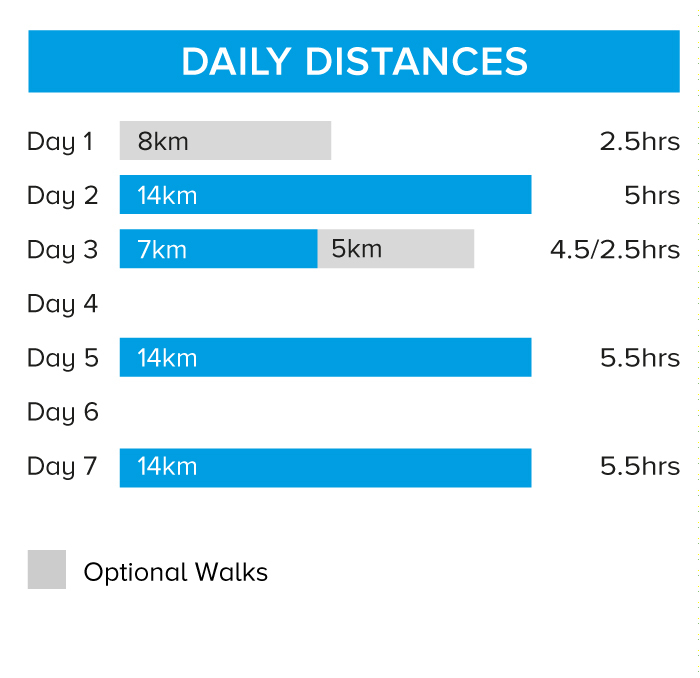 Today's 12 kilometre walk is expected to take approximately four-and-a-half hours with a total ascent of 600 metres and descent of 250 metres. Today has been left free; with trains to Venice from Bassano running regularly and taking around an hour, you can enjoy a full day in this magnificent city if you wish. €20.00 will buy you an unlimited boat ticket in the city, allowing you to travel along the Grand Canal or even travel to Murano and Burano to see a quieter side of the city and some of the local glass production. Today we head through a rolling landscape of vineyard-clad hills in the heart of Prosecco Country, towards Valdobbiebene. Our walk passes through the vineyards with views of the lower valley, and ends at a local winery where we plan to enjoy sampling various types of prosecco. There is even a prosecco without bubbles! Today's 14 kilometre walk is expected to take approximately five-and-a-half hours with a total ascent of 305 metres. We drive to Verona Airport this morning where the trip ends. 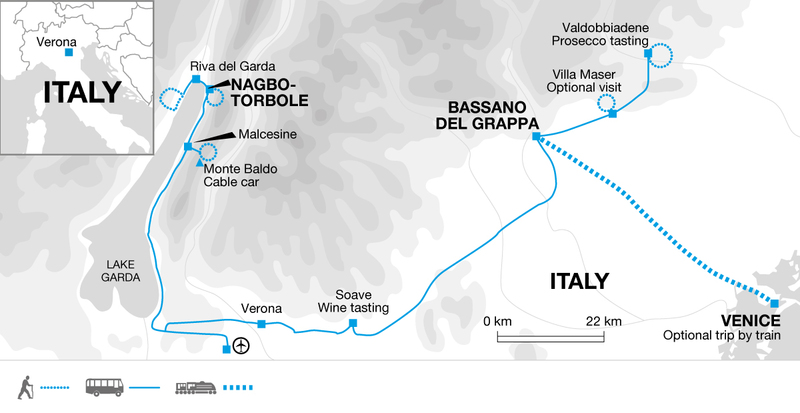 Venice: Train from Bassano del Grappa - €20.00 return ticket. We recommend you bring lightweight walking boots, make sure that your boots are worn-in and comfortable before the start of the trip. Also trainers or sandals for relaxing and general wear. We suggest that on international flights you either carry your walking boots in your hand luggage or wear them - should your luggage be lost or delayed, your own boots are the one thing that will be irreplaceable. One main piece and a daypack. A water bottle, sunhat and high factor sunscreen are all essential. Take your walking poles if you normally use them. A torch is useful in the WWI tunnels on the Cima Rocca walk and in case of power cuts or emergencies. At your discretion you might consider tipping your Trip Leader in appreciation of the efficiency and service you receive. Walks on 5 days for between 2.5 to 5.5 hours. Most trails are well-defined and the terrain is easy underfoot. Total daily ascent averages at around 500 metres.